Leading up to the start of the 2011 Regular Season, Diamond Hoggers will preview each of MLB’s 30 teams . Today’s preview features the Oakland Athletics. Stay tuned as Diamond Hoggers previews every team division by division until the start of the regular season. They play competitive baseball without ever really having a star. A nearly a decade after Moneyball arrived, the A’s are still Money-balling it out. Now, while we’re on Moneyball; not everything in that book came true. I am pretty sure Billy Beane told me that Eric Hiljus would be a stud. I’m still waiting on that. Billy Beane also said Prince Fielder was too fat for his liking. He was the youngest player to ever hit 50 home runs. What the A’s really are is a bend but don’t break defense in the form of a lineup card and rotation. They’re never going to be jump-off-the-page good, but they’re never going to lose 100 games. Really, Beane has mastered the art of being at least mediocre and in a year where you have a few young players that have better years than expected, you even wind up .500 or so. If Beane was really serious about all this, they would have went out and signed Adam Dunn this offseason. He would have to be one of the greatest Moneyball type players of our generation. He’s an OPS machine and plays every day. After all the great pitching, defense, and guys who make less outs than the guys on our team; what do the A’s really have to show for it? Congrats on your ALDS losing flags on the wall boys. You guys are the Buffalo Bills with less clout. So someone offered me a trade in one of my fantasy baseball leagues recently, and it was for this Chris Carter kid. The A’s are billing him as the headliner, and he hit .186 last season and it took him 33 big league at-bats to get his first hit. That happens, but to want to rush one of your prospects because your team is that desperate for power is the quality of a poorly built club. He’s 6 foot 5 and 230, so he should be able to rattle some fences. But as we’ve talked about before, the Oakland Coliseum isn’t exactly an offensive launching pad to begin with. Carter will probably get his 20 homers. But, so what. They can definitely out-pitch you. This is how the A’s win games. They get quality starts and when you get 6 or 7 of them in a row, you’re only going to lose about half of the time at worst. Even with an anemic offense like the A’s, when you trot out Trevor Cahill (18-8, 2.97), Gio Gonzalez, Brett Anderson, and Dallas Braden; you’re going to have some success. Not of them are power type guys with maybe the exception of Gonzalez, but they could all probably win 15 games by hitting spots, painting the black and generally just going 7 innings and stranding runners. Don’t forget that an old face is back after all this time, Rich Harden. Andrew Bailey is absolutely legitimate. If you look at his numbers at the Major League level, the game is over once he enters it. The only thing separating him from Brian Wilson or others in the elite territory is that he gets about half the chances of guys on great teams. 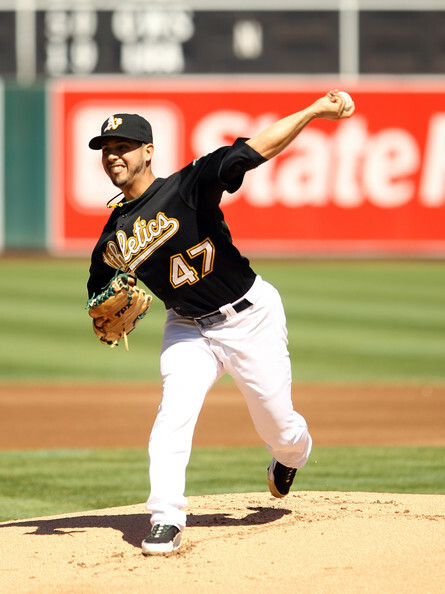 Additions to the bullpen include Brian Fuentes and Grant Balfour. These are two very key guys to have on a team. If the A’s can score some runs, they’ll be tough to play from behind on. Mark Ellis is the last remaining element from that 2006 team that reached the ALCS. He’s extremely underrated and a great little player that represents the foundation the A’s build their roots upon. He’s joined by Cliff Pennington, underrated in his own right. Not a lot of these guys have fantasy value or put a ton of fans in the seats but they play the game the right way, and they’re grinders. You have to at least respect what they accomplish as professionals. Kevin Kouzmanoff and Daric Barton are the corner infielders. Again, not guys who will knock down fences, but solid big league players who will hold their own (and hit between .240 and .250). That’s where an Adam Dunn could have added a few wins and sold just a few more tickets, right? The outfield has Josh Willingham, Coco Crisp, and David DeJesus. The catching tandem of Kurt Suzuki and Landon Powell should be nothing short of ordinary. Bob Geren survived three straight losing seasons and then hit the jackpot last year by going 81 up and 81 down. They’re going to be battling the Mariners for the cellar, and we predict them at 73 wins. Again, they’ll survive on their principles of Moneyball, but that doesn’t do a lot for putting butts in the seats and how long has it been since you’ve seen these guys on anything but the local FOX affiliates for television? Try something new A’s. The shark has jumped Moneyball.